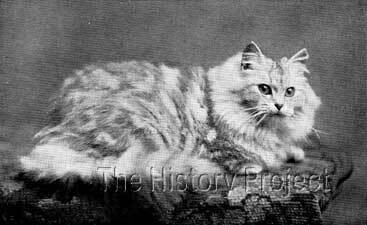 At a time when the field in Silver Tabby long-hairs was dominated by Miss Anderson Leake's descendants of 'Ch. 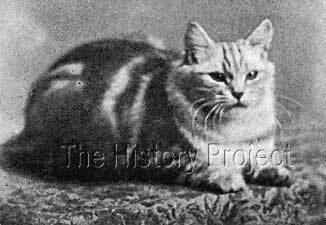 Topso of Dingley', by cats like Mrs. Moore's 'Ch. Felix', and his sons 'Felix Mottisfont' and Mrs. Leake's own 'Abdul Zaphir of Dingley', 'Ch. Thames Valley Silver King' seems to have appeared out of left field, offering a much needed supplement to existing bloodlines. At best, the parentage and ancestral heritage of 'Thames Valley Silver King' is vague, and his main claim to fame, is as a massively framed, well-marked silver tabby male, who contributed to the emerging gene pool of silver tabbies, and who, in his day, was one of the only reputable silver tabbies of significance, that was basically unrelated to those descended from 'Ch. Topso of Dingley'. 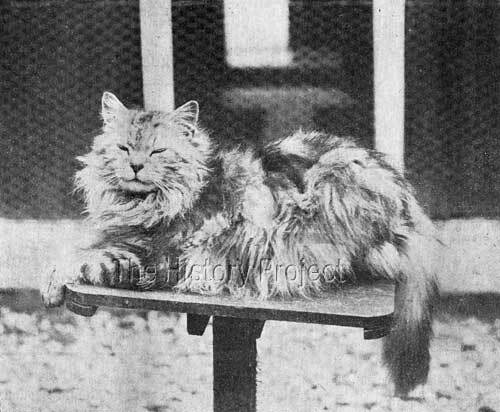 This genetic diversity proved to be his greatest asset, as it offered breeders whose stock were descended from 'Ch.Topso of Dingley', a timely and valuable outcross, ensuring his placement on the pedigrees of some of the greatest silver tabbies to be bred in the early years of twentieth century. Genetic diversity proved to be his greatest asset. In the long-term, his greatest claim to fame, was as the sire of Miss Cope's 'Roiall Dewdrop', the dam of 'Ch. Don Pedro of Thorpe'. 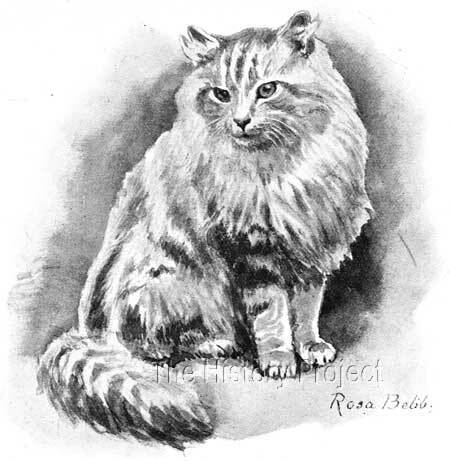 There are a number of females are registered as 'Flossie' but the writer believes that the most likely contenders as the dam of 'Peggy Pride' are either 'Flossie Mottisfont', a silver tabby female who traces her pedigree back to the Silver Tabbies out of Mr. King's bloodlines, or 'Flossie', owned by Lady Pink, the breeder of 'Shrover', and the sire of Mrs. Herring's 'King David'. In either case, there is likely to be a pedigree connection, even if only obscure, between the two great families of Silver Tabbies, most likely through Mr. King's 'Tee'. The only owner of record is Miss Derby-Hyde. Miss Hyde's taste in cats was quite eclectic, and at any one point or other, she had in her cattery, Blue, Orange Tabby, Silver Tabby, and Chinchilla long-hairs, as well as Siamese and White English short-hairs, particularly blue-eyed white short-hairs and others. 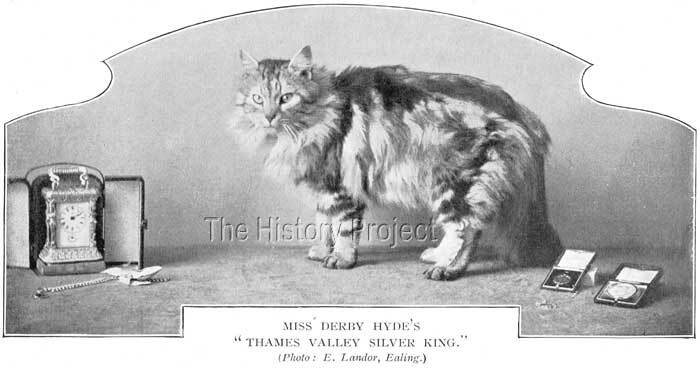 'Thames Valley Silver King' appears to be her most famous cat. Mr. C.W. 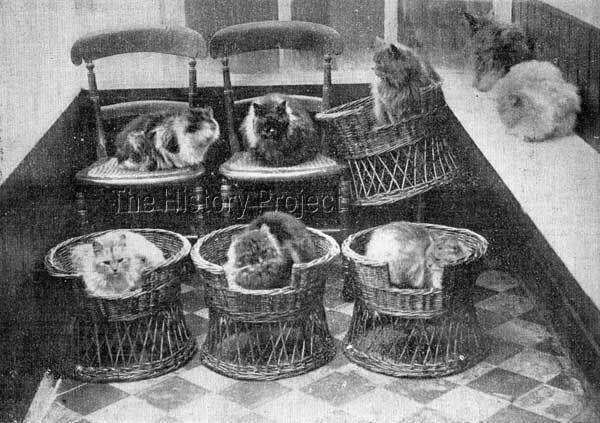 Witt, upon visiting her exceptionally well-appointed cattery in 1904, had only one criticism, that she had a mix of too many varieties of 'also-ran' cats and needed to specialise more, holding only the best cats she could lay her hands on. Of her cattery, we have excerpts from his report. "It was my great pleasure to visit Miss Derby-Hyde's up-to-date cattery at Hawthorne Cottage, Strawberry Vale, the other evening and I must say at once an one before in all my travels. The arrangements for the comforts of the inmates are splendid, and much as I had heard of their excellence it far exceeded my expectations. A siesta on the Verandah, inside Miss Derby-Hyde's cattery at Hawthorne Cottage. "I understood Miss Derby-Hyde to say the buildings alone had cost her over £300, and I can quite believe it. I was particularly struck with the runs, which were most roomy, as besides having a wired-in grass fine-weather run, say in front of the houses, there was another covered-in run at the back of each, enabling the occupant to get exercise outside its house even in wet weather. "Words fail me to adequately describe two of the larger houses, which are palatial and fitted with carpets, rugs, and chairs for all the world like villas, and although so near London, (in fact I suppose it is a part of London), there was no lack of room, as the runs are just roomy delightful shady nooks with fruit trees growing in and around them, and I would advise any fancier who is near to go and see how our pets should be treated. 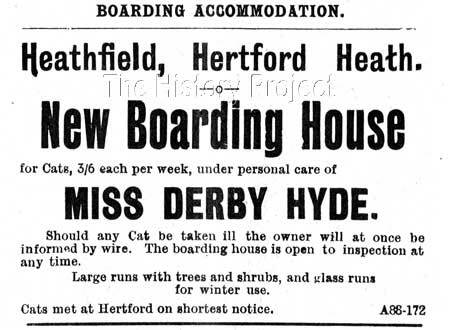 1903 Advertisement for the New Boarding Cattery, under the personal care of Miss Derby-Hyde. Note the rate, which is equivalent to sixpence a day. There are no siblings of record of 'Thames Valley Silver King'. "Winner of 16 firsts, numerous Medals and Specials, sire of many winners." As already indicated, the greatest value offered by 'Thames Valley Silver King' apart from his obvious benefit of his physical characteristics, of size, boning, and patterning, was as an outcross to other bloodlines. He was subsequently mated to two outstanding silver tabby females, producing progeny of note. In one particular case, the female from this breeding would in her turn become the dam of another great winner within the variety, cementing his grandsires name on silver tabby pedigrees for many years to come. Although a number of other queens were bred to Miss Hyde's male, the most notable were the above two females, and the only lasting testament to his efforts as a sire, were to be through his famous grandson, Mrs. Slingsby's 'Ch. Don Pedro of Thorpe'. 'Thames Valley Silver King' enjoying an afternoon nap in his private yard. 'Thames Valley Silver King' - from a watercolour by Rosa Bebb. Cattery advertisement for the 'Thames Valley' Stud. In Summary: If it had not been for the advice given by Mr. Charles A. 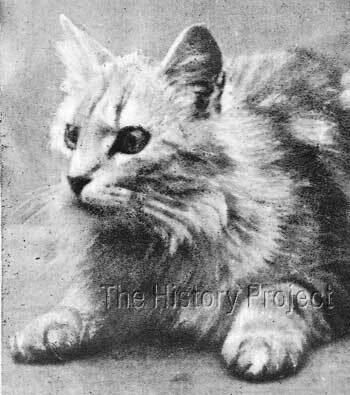 House to the relatively novice breeder, Miss Cope, to breed her silver tabby female, 'Roiall Silver Tangle', to Miss Derby-Hydes well-known silver tabby male, 'Thames Valley Silver King', then there would have been no 'Roiall Dewdrop' nor her son 'Don Pedro of Thorpe'! 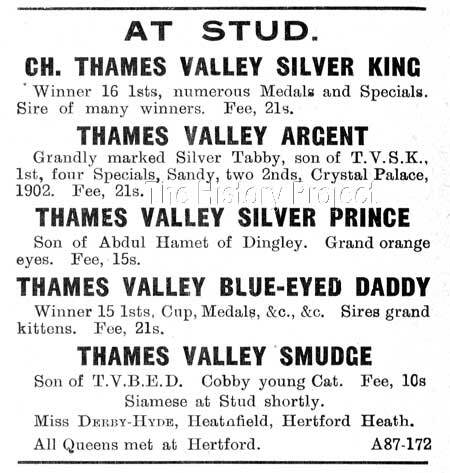 And as a consequence of that, the only record of 'Thames Valley Silver King' would have been relative to his own wins and the spot given to him in Frances Simpson's record of the early silver tabbies. Often things happen by chance, and in this case, the advice given was heeded, the progeny and experience secured, the pedigrees and new options established, and the rest has been left to history. As it happens, Miss Cope secured excellent results both with and without this outcross, finding out for herself, that line-breeding on Miss Anderson-Leake's bloodlines worked exceptionally well. ('Silver Tangle' direct to 'Abdul Hamet', producing 'Roiall Fluffball). But equally, that by going out to 'Thames Valley Silver King' and then back in to Miss Leake's 'Dingley' bloodlines, also produced great results, in the form of 'Roiall Starlet' and her sibling 'Don Pedro of Thorpe'. For his part, 'Thames Valley Silver King' offered great size and bone, coupled with well-defined markings on a clear ground. We are reminded from Miss Copes experience with this outcross, that what matters most, is 'how' you build your pedigrees, and then what you do with them! Serious breeders always breed to a well-considered plan and will never breed for the sake of convenience. They are open to learn from their experience, and to adapt or tweak the plan based upon the results. These are the breeders who stay the course, and produce the most consistent results over many years. Those who don't follow this well-considered path, are here today, and gone tomorrow.